As a way to join in on the collective efforts of the comic book community, I have donated this original inked Superior page (Issue #4 | Page #15) and left it with the kind people of Druid’s Keep/DK Collectibles, Inc. over at their Fort branch. Art by Leinil Francis Yu and inked by Gerry Alanguilan, Superior (2010) holds the Guinness Book of World Records for being the fastest comic ever produced as well as having the most number of creators working on a single comic. Sir Gerry signed the piece at the Komikero Komiks Museum in San Pablo City on August 13, 2016, while Leinil added his signature during Free Comic Book Day 2017 at Filbar’s Megamall. Clockwise: The calm before the storm: Leinil’s desk. | First in line! | Leinil signs Page 33 of Supercrooks #4. | My copy of Indestructible Hulk #1 signed by writer Mark Waid, inker Gerry Alanguilan, and now penciller Leinil Francis Yu. | Lenil and Gerry’s signatures at the bottom of the aforementioned Page 33. | Thanks again Leinil! For many, Free Comic Book Day (FCBD) serves as an annual opportunity to get new readers (as well as old ones) into the hobby by offering a wide selection of books that they would not normally pick up. But in recent years, the status quo of FCBD in the Philippines has evolved beyond its original purpose and into an event wherein the local comic distributors and artists give back to comic book community. For me, the highlight of FCBD 2017 was being able to attend Leinil Yu’s signing over at Filbar’s Megamall. [i] Without going into great detail, Leinil was very gracious and accommodating. Thank you again Leinil! Philip Tan gets the ball rolling well before his call time of 1 pm. | Philip’s three 2-hour sketches: Harley Quinn, Spider-Man, and the Dark Phoenix. | The Spider-Man sketch that Philip did for me on my Clone Conspiracy Blank Cover Variant. | Photo opportunity with Philip. | Posing for a photo with Elmer Santos. | Elmer’s Spider-Man sketch on my Champions #1 Blank Cover Variant. Certainly one that I didn’t expect having when I woke up this morning. Here is how things went down. With Sandy’s announcement that The Hellblazer[i] creative team of Philip Tan (artist) and Elmer Santos (colorist) would be taking several sketch commissions–for free!–during their Signing and Sketch Event today, it made a lot of sense for my good friend Mark and I to make our way to Fully Booked in Bonifacio High Street before they opened at 11:00 am. San Antonio Spurs versus the Memphis Grizzlies–a game for the ages. Mark and I got to High Street early so we decided to head to the nearby Italiannis to catch the San Antonio Spurs and Memphis Grizzlies game. This was a rare treat for me as I usually don’t watch television anymore[ii]. Game 4 between these two teams also served as my first game in this year’s NBA Playoffs. And what a game it was! As Mark and I settled into our seats, Memphis–down 2-1 in the series–had erected a formidable 10 point lead early in the fourth quarter lead by Grizzlies $153 dollar quarterback Mike Conley, Jr.
Clockwise: And then there were two. Notice the now defunct Press Cafe. | Comic Odyssey’s window display on the 4th floor of Fully Booked ATC. | Picked up several issues of Terry Moore’s Echo [Issues #10, #16, #18, #19, #23, and #24]. | Panoramic shot of Comic Odyssey. Thanks for the memories. I wasn’t planning on writing about this today but I just got word earlier this evening that Comic Odyssey in Alabang Town Center will be moving from the 4th to the 2nd floor of Fully Booked Alabang by Thursday (February 8, 2017). My sources tell me that the 3rd and 4th floors are to be rented out to the real estate group Alveo Land. Real estate and books: What an odd and soon to be familiar combination considering that the only way to access the third and fourth floors of the premises are through the escalator and elevator located on the ground floor. 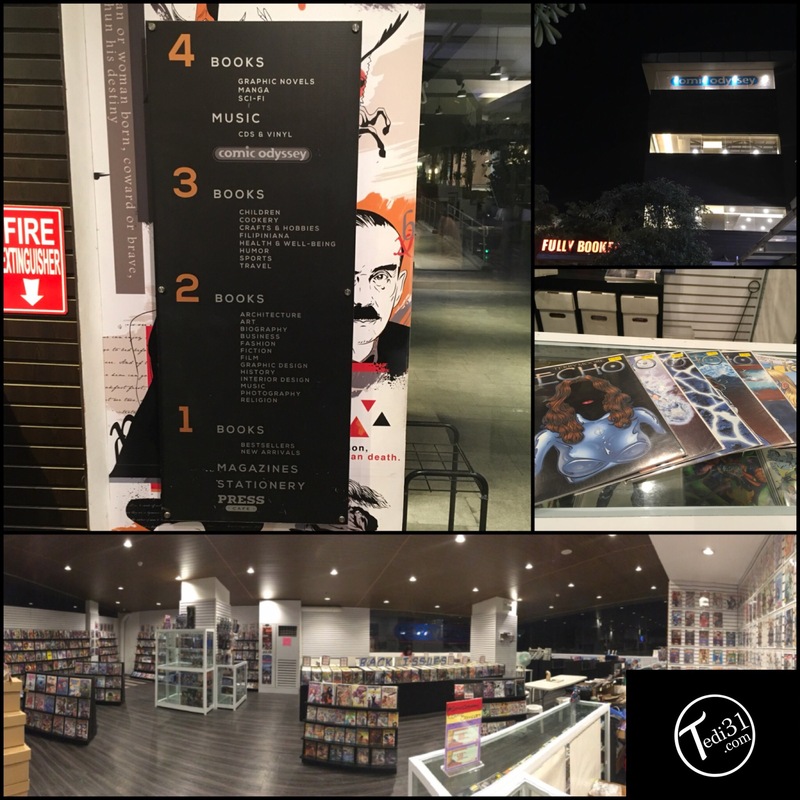 This development would mean that the modest book selection of Fully Booked will become even smaller as the merchandise from the 3rd and 4th floor will now merge with the 1st and second floor. Comic Odyssey is set to have a nice slice of the 2nd floor, but I am sure that given their space constraints, they would have to be conservative with their comic titles as well. It’s news like this that breaks my heart on so many levels. Doesn’t anyone read anymore? Don’t they realize that by not patronizing our local book and comic books shops that we–the consumers–would ultimately lose out in the end. If the stores don’t make anything, they will be forced to close their doors while consumers would lose out on that chance, that opportunity, to have a very personal and intimate experience that only a book can give. Time to think about it.